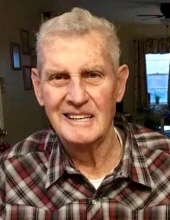 Gerald Lee Groves, 86, of Nettie, WV went to be with his Heavenly Father on April 11, 2019 at Hospice of the Piedmont in Charlottesville, VA.
Gerald was the son of the late Harrison and Clara Rader Groves of Canvas, WV. He was an Army veteran of the Korean War and received medals for his service. He was a coal miner by profession and retired in 1994. He loved his Lord and his family. He enjoyed gospel music, spending his time outdoors on the farm and hunting in the woods with his dogs. He loved making people laugh and always had a joke to share. He was an active member of Olive Branch Baptist Church of Nettie, WV and enjoyed the company of his friends in his beloved community. His favorite time of year was spring when it was time to dig the ramps or fall when it was harvest and canning time. He will be sorely missed by all those who knew and loved him. Gerald was preceded in death by his brothers: William Harrrison (Jr) Groves, William R. (Doc) Groves, Jennings Groves, and his sisters Eunice Conley and Jeanieve O’Dell. He is survived by his loving wife of 61 years, Jackie McMillion Groves; a son, Timothy Lee Groves of Charlottesville, VA; a daughter, Star Ann (Larry Joe, Jr.) Davis of Raleigh, NC; grandchildren: Sarah (Jesse) Kitchens and Hannah Davis; his sister-in-law Rebecca (Rev. Gary) Eisenman of Dawson, WV and several beloved nieces, nephews and cousins. Service will be 1:00 p.m., Monday, April 22, 2019 at Olive Branch Baptist Church, Nettie with Mr. Larry Gawthrop officiating. Burial will follow at Fairview Cemetery, Nettie. Friends may call at the church one hour prior to the service. Wallace & Wallace of Rainelle, WV are in charge of the arrangements. "Email Address" would like to share the life celebration of Gerald Lee Groves. Click on the "link" to go to share a favorite memory or leave a condolence message for the family.